Home 2017 2018 Agenda Budget Democracy Dictatorship ECAS India Elections Erdogan General India Kemel Ataturk News Parliament President Prime Minister Recep refrendum Turkey Turks Turkey Elections 2018 : What and Why was the World Worried About? 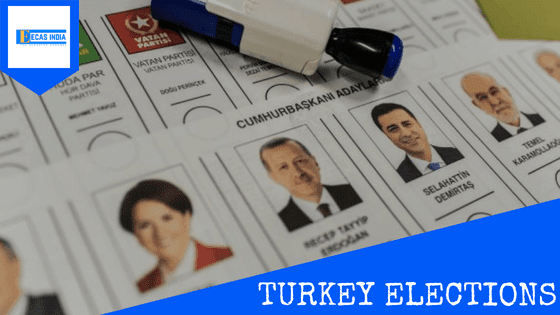 On April 16, Turkey narrowly votes 'YES' on the referendum that would democratically reorganize the government. The referendum allowed the changes that would eventually give the sweeping powers to the President of the country, Recep Tayyip Erdogan. He could have complete control of country's budget and military, will be able to appoint judges to the court without the voting procedure similar to the Democracy of India. Also, he could dissolve the Parliament whenever he chooses and can extend the term limit which means he could stay in power until 2029. The elections after this referendum are one of the major reason for which the world was worried about the future of Turkey. This referendum had earlier prompted concerns making the President of Turkey too authoritarian. The past history of Turkey had made this one a concern as Turkey was built by authoritarian which begins with Kemel Ataturk. Kemel Ataturk, being the first President of Turkey was granted the dictatorial powers and named himself 'Ataturk', meaning the Father of the Turks. He was the military General who created the Republic of Turkey out of the collapsed Ottoman Empire in 1923. During the 15 years in the office, he enjoyed the similar powers to that of Erdogan. He put mosques under state control. He made illegal to discriminate against women by making the women education compulsory. rising to the literacy rate, after which he opened many schools. This time political parties have been allowed to form free poll alliances which could offer a counter-weight to a stronger presidency. AK Party is part of what's called People Alliance, four others including Republic Party are the part of the National Alliance. These alliances could also help the smaller parties get a foothold in the Parliament if their coalition wins over 10 percent of the vote.